"Perhaps, in the turmoil of those last moments in the future," Alice would sometimes whisper to herself, "I was confused with Celia? Perhaps it was the Automated Alice that really came back to the past?" And until the very end of her God-given days, my dear, sweet Alice was unable to decide for certain if she was really real, or else really imaginary . . . Which do you think she was? Still she haunts me, phantomwise. It's conventional and no doubt correct to read the I of this poem as Lewis Carroll's, the pseudonymous author/screen standing in front of Charles Lutwidge Dodgson, but I prefer to think of both the she and the me in the first line of the tercet as belonging to Alice: Alice the dreamer, Alice the literary character, Alice the girl who is not herself, versus Alice Liddell, the young woman who peels off from her poetic self and goes on living outside of wonderland, this side of the looking-glass. Carroll's books are not only about the ambiguity of proper names, but words in general, and their relentless play with meaning and sense, sign and image, the literal and the poetic, make Alice the perfect candidate for adaptation and creative reinvention. Of which there have been scores: Wikipedia has a typically comprehensive list, while this blog takes a more measured approach. I've read or seen a fraction of these versions of Alice, but one thing that has always struck me is that it's rare for them to fall apart completely. You can play it straight, or straighter - say, by getting human actors to play the creatures without the disguise of elaborate costumes (h/t k-punk for this rather exceptional tea-party scene from the BBC adaptation with Peter Cook as the Mad Hatter) - or depart more or less completely, using the original script as a template. The joy of the original text is such that even the most conservative, domesticated versions will have something going for them - yes, even the Disney cartoon feature of 1951 - while it's hard to conceive of truly unfaithful reimaginings. How can an Alice, any Alice, be the wrong Alice? There is something quite perverse about Tim Burton’s Alice in Wonderland. Here (for those who don’t mind spoilers) a grown up Alice returns to wonderland whilst fleeing the scene of a marriage proposal only to find the place on the brink of all out war between the Red and the White Queen. It is prophesised that Alice alone can save the side of good (which happens to be the white one) by slaying the Jabberwocky on the frabjous day, but grown-up Alice is initially declared to be the wrong Alice. Thus before she can brandish the vorpal sword and defeat the Jabberwocky she needs to learn to be herself again, with the help of the Mad Hatter, the Rabbit, the Caterpillar, the Cheshire Cat and all the other creatures who had been incidental travel companions at best during her original adventures. Having completed her quest, a fully mature and self-actualised Alice returns to the real world, becomes a merchant trader and sails off on a ship to establish a trading post in China. 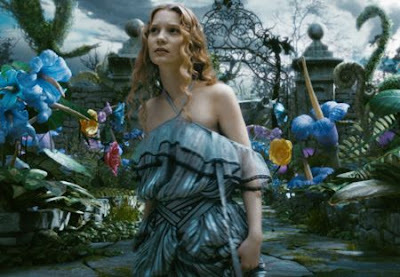 In the Alice books, there is the feeling that Wonderland is Alice's world alone, yet she has no place in it. She is always late, in the way, misunderstanding what ought to be obvious ... In this way, Carroll is the precursor of Kafka, and ultimately Alice's Adventures In Wonderland has far more in common with The Trial and The Castle than with The Lion, The Witch and The Wardrobe or The Wizard of Oz. K's blundering attempts to penetrate the court and the castle, his exasperation and impotent acts of rebellion, echo Alice's frustrations in Wonderland. The adult world as seen by children is, precisely, a Nonsense world, incomprehensibly inconsistent, arbitrary and authoritarian, full of bizarre rituals. As he also goes on to note, where Burton’s direction and Linda Woolverton's screenplay truly pervert Carroll’s work is by making Alice’s quest one of good versus evil. If ethics is to be found at all in the books, it's most decidedly not of the messianic variety - if anything the idea that children’s stories should have a moral is lampooned throughout, as is each and every form authority. So the only explanation is that the change occurred in Alice herself: having grown up, she no longer finds the world perplexing, but in order to carve out her place in it she still needs to acquire something else: a steely sense of her own capacity to make the right decisions. She is to become, after all, a venture capitalist, entrusted with the money invested in her company. That is not the job for a dreamer who quibbles on the finer points of semantics. That is not the position for a person riddled with self-doubt, or indeed doubts of any sort. She has to give up wondering once and for all. Burton’s Alice is nothing less than an ode to a mythical heroic age of capitalism, which at least makes it a far more coherent film than Avatar. Cameron tried to shout at us an anti-imperialist message using Rupert Murdoch’s megaphone, and it rang false; while Burton found in Disney the perfect corporate partner and thus their Alice - heeding the March Hare’s advice at the tea table - says exactly what she means. It’s an honest, straight-talking Alice, yet also most assuredly the wrong Alice. Here we are again at that place where we pause to contemplate that peculiar meaning-making industry that is cinema, its unique place at the interface between commerce and fantasy, labour and pleasure, capital and the symbolic. Fantasy is its prime raw material, and the process of transformation is failsafe: gather a team of engineers, establish a schedule, license the software; feed the concept to the marketing department; design the merchandising, find the most profitable tie-ins; secure the film’s distribution and an adequate supply of 3D glasses. Almost none of it has anything to do with the fantasy itself. It is a flowchart. All that it requires is for the right decisions to be made. Is it even possible, at that high end of cinema, to make a substantially less-wrong Alice? Would she have been safer in Pixar’s hands? I doubt it. There is no place for the slightest hint of an unintended meaning in today’s blockbusters; even the good ones are tightly controlled, like a software routine that won’t run unless it has been thoroughly debugged. And so too are the scripts - even the good ones, in fact especially the good ones - thoroughly sanitised from any stray sense-making germs. 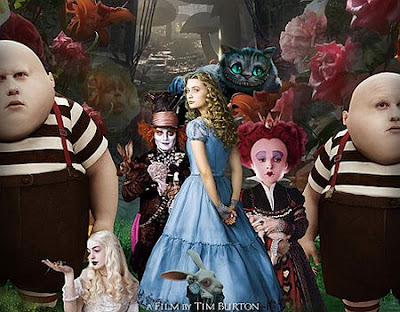 There is in fact a common objection to Burton’s film that I consider slightly misdirected, namely that it engages in very little verbal play; but that’s not the language in which I’d expect Tim Burton to be able to emulate Lewis Carroll, so I’d rather ask: where is the visual play? Where is the turn of image that enriches the meaning of a scene or illuminates a theme? Or haunts you. There is only one I can recall: the crossing of the moat in the Red Queen’s castle, that Alice completes by walking on the semi-submerged heads of executed minions. 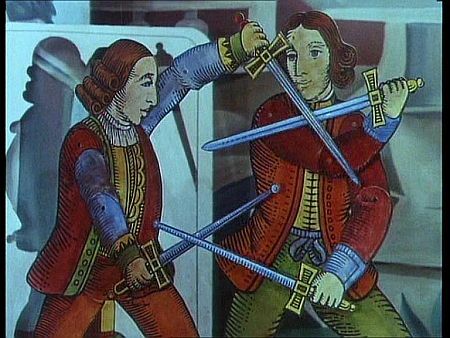 A quick look at Jan Svankmajer’s animated Alice will underscore how meagre that single tally is, how much more could have been achieved - but at the cost of confusing the flowchart and disrupting the goal-oriented logic of enjoyment that the product demands. Play is work, and work is play. So we can’t have that. There is really only one not-wrong Alice that I could expect Disney or any other major studio to produce, and it is a failed Alice. Where somebody like Terry Gilliam is entrusted with the project, and spends three years working on the script, one year alone with his sketchpad, another two years scouting locations, then shoots half the thing, goes twice over budget and gives up or is let go. Then another filmmaker comes and rescues some of the footage and shoots a documentary about the film that almost was, and that couldn’t possibly have had the integrity of the film that wasn’t. But it hardly ever happens anymore, and those executives just won’t be haunted – phantomwise or otherwise. Read k-punk's review and the follow-up post with his readers' reactions. Now, as we admire the Nevsky's fine appearance, with its busy and festive atmosphere, we find it difficult to imagine this street twenty years ago, in the grim days of the war. Among the snow-drifts one could make out the mangled shapes of shell- or bomb-wrecked trolleybuses and lorries frozen into the snow. The shop-windows were boarded up. The street was almost deserted: a bundled-up figure trudging wearily to the cemetery, pulling a child's sled with a swathed body tied to it, was not a rare sight. There it is, that image of a swathed child’s body being pulled through the streets of a city under siege, and through time. 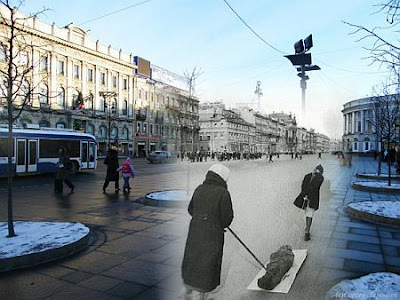 I have thought of it often since Nina Power first posted last year the link to that extraordinary series of montages of Leningrad then and now. I have now encountered it again, this time in words, inside of an old guidebook to the city sent to me by a very kind reader. Both the montage and the written passage ask of us to do the same thing, to juxtapose two moments in time that seem utterly incongruous, two kinds of normalcy: one human, one inhuman. The people in the present tense can scarcely imagine what the street on which they walk has seen. In the timelapsed photograph it's as if they were callously indifferent to it. Preparing to board a trolley bus, instead of calling for help. ‘It’s exactly the same.’ The beer, that is. It makes no sense to wonder to what party the protagonist of this little vignette thinks he might be going to return to, or to what existence for that matter, since reality doesn’t extend beyond the one-minute of television time bought by the sponsor. There is quite literally no space nor time allowed for reflection. The Leningrad blockade montages by contrast are a far more open text, posing a direct challenge to our fundamental understanding of history and articulating the fear that it might some day fold upon itself. The aerial protection balloons, those bodies pulled through the streets - they might return. Perhaps they never went away. I enjoy reading old guidebooks. Throughout my childhood we used to travel around Italy with TCI guides that were at least twenty years out of date, and I was often put in charge of reading aloud the wonderfully ornate descriptions of churches and palaces, full of references to architraves, cornices and crenellations. Attractions had either one star or two stars, or none at all. We put a lot of faith in this, chasing two-star cities and monuments and finding only very occasionally reason to disagree with the authors’ judgments. Of course in the intervening years the opening hours of some of these attractions had changed, the odd museum had been reorganised, the odd collection relocated. But on the whole those books - which had been purchased when my parents went on their honeymoon - served us just fine. They might have been a tad conservative, but then so was my parents’ taste and besides we had no interest in living culture or anything contemporary, just in the monuments. 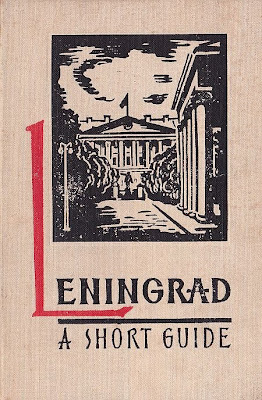 The Short Guide to Leningrad is almost, but not quite, as old as those books. In our time the greatness and historical significance of Lenin's activity, whose name is inseparably linked with the turning-point in the history of mankind—the transition from capitalism to socialism—are manifested with particular force. This transition, which was begun with the October Revolution in Petrograd, makes the substance of the present epoch. 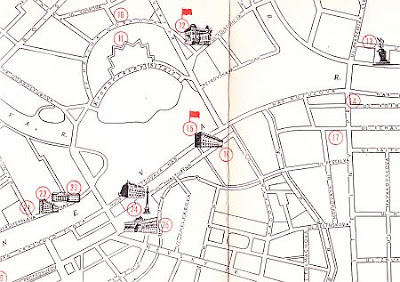 There are over 230 places in Leningrad associated with the life and work of Vladimir Ilyich Lenin. Out of these 230, there are 41 entries on the ‘map of places in Leningrad associated with Lenin’s life’. Given enough time and careful planning the tourist could connect them in chronological order and end up - at the culmination of a sort of communist Bloomsday - in the palace known as Smolny, there to mentally re-enact those days of October 1917. Or was it November? For there are complications. 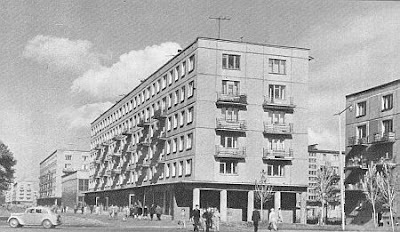 Not only have most of the street names changed - Lenin’s apartment in Yamskaya Ulitsa is now in Ulitsa Dostoyevskovo, the flat where he stayed in Sergiyevskaya Ulitsa will henceforth be found in Ulitsa Chaikovskovo, and so forth - but time is marked differently too, following the abandonment of the old Julian calendar after the revolution. Yet P. Kann feels compelled to painstakingly record these changes, as if aware that the old nomenclatures might one day return. [i]t has been placed on a concrete foundation, the roof has been completely repaired, and all the walls and woodwork have been treated with special resinous solutions to protect them against the destructive influence of time. Lenin's room is very simply furnished: there is an iron bedstead, a small round table and on it a vase of field flowers, a sofa, three bent-wood chairs, a table which has on it an inkstand and a kerosene lamp, and a hall stand with three hooks beside the door. ‘The destructive influence of time’. Fifty years and many commotions later, I wonder what remains of all that, which of those dwellings have been converted back into regular residential real estate. After all one could reasonably ask, how many Lenin memorial flats are too many? With my map and P. Kann’s meticulous instructions (‘flat 15, second floor’) I could check them all out, see which ones have survived. That would be a worthy project, no? And while I’m in Russia I might check on Vladimir Ilyich himself, seeing as he’s also been treated with special resinous solutions. In episode one of Life after People they speculated in fact on how long it would take for terminal decomposition to take place, should people stop caring for that body. But I don’t want to turn morbid nor misrepresent the Short Guide, which isn’t solely about the traces of Lenin and is a fine example of its genre: well written, informative, at times lyrical and profound - nowhere more so than in the passage at the top of this post. It is guilty of obfuscation and propaganda, of course, but no more so than other book of its kind. It is, finally, a document of its time, and of a relationship with the historical past that is also the product of an ideology, as it always is. Characteristically, this ideology is visible also in the choice of images. There are forty-four in total at the end of the book - I've included them all in a separate gallery for lovers of the genre - and yet there are as many pictures of the inside of the Hermitage as of the outside of the cruiser Aurora (that is to say, one each), and several more of residential buildings than either of those. If I had to pinpoint a difference between the Short Guide and the books we used to take on our holidays, it would be precisely that accent on ordinary lives not as object of folkloristic appreciation but as a concrete historical object, as in the mention of the 440,000 builders that toiled to construct the city’s cathedral, or the references to life during the blockade. However of the actual inhabitants of Leningrad in 1963, the beneficiaries of that watershed historical transformation, nothing is said, except insofar as it is intimated that the city creates the conditions for their full realisation and well-being. They too are, in light of what we know now, of what ought to have been known back then - seven years after Hungary, five years before Prague - a silent yet haunting presence at the margin of the picture. P. Kann. 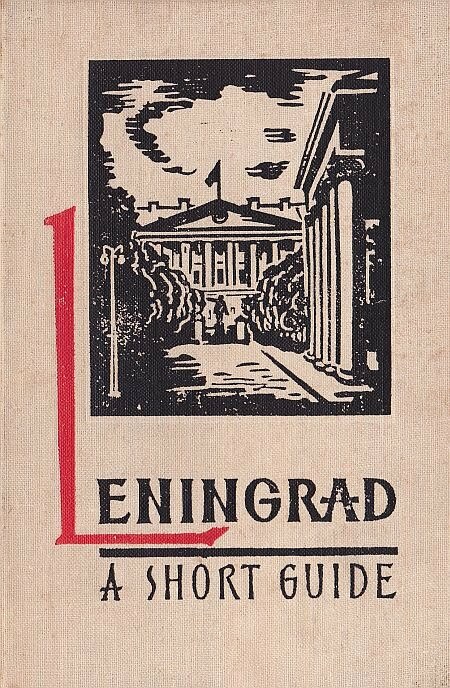 Leningrad - A Short Guide. Translated from the Russian by Y. Golyakhovsky. Moscow, Foreign Languages Publishing House, 1963. With many thanks to S.F. for the book. ETA:More Leningrad retrographs have come to hand. Under the somewhat deceptive title of Collection Appraisal Project, the library at Victoria University proposed in 2004 to dispose of up to 130,000 titles - approximately one-fifth of its overall holdings - so that some of its space could be freed up for other functions than the storage and display of books. It was initially decided that the books that hadn't been taken out of the library for ten years or longer would be marked for inclusion on this list, and that it would be up to the academic staff and students to indicate whether any of them should be spared. Once this initial phase had been completed, some of the books would be relegated to the stacks and the balance would be de-selected, that is to say destroyed. 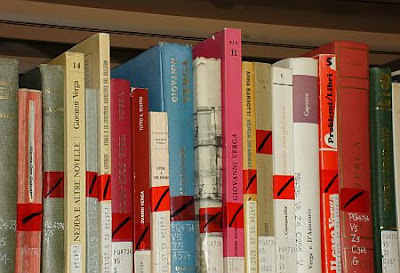 Library staff proceeded therefore to apply red stickers onto the spines of these seldom-borrowed books, and informed us that in order to take them off the list we would have to mark the stickers with a black felt pen. This didn't go down well, especially in the humanities. In an email circulated around the faculty under the subject line 'Barbarians at the gates', Professor Robert Easting lamented the time he had been forced to spend on his hands and knees hunting for red-stickered books. He pointed out that the already scarce holdings of the library could hardly afford to be reduced further; that the crude ten-years criterion was singularly ill-suited to establish relevance to humanists and social scientists. He described the practice of destroying books as 'barbaric'. Soon the polemic reached the newspapers and a nationally televised panel TV show, and some time later the plan was abandoned. But the books themselves preserve its memory. To this day if you browse the library, especially on certain floors, you'll find more books with the red sticker than books without. The Italian section was hit especially hard. Whole shelves, whole centuries of our literature had been plastered with the stickers. I recall going through them at the time and marking them just as indiscriminately. Save one, save all. I don't care how long it has been since the complete works of Giovanni Boccaccio were checked out. We need them; they must be there, occupy that space, or we might as well not have an Italian department at all. It had already been marked with a thick black forward-slash by the time I got there, but I recoiled especially at seeing Antonio Gramsci's Lettere dal carcere sporting a red sticker. 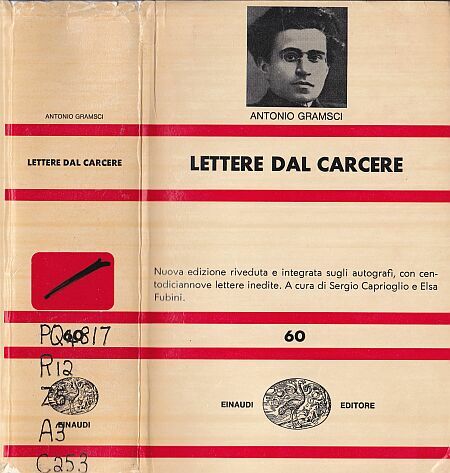 The letters that Gramsci had penned as a political prisoner, under the constraints of censorship and the rationing of his writing privileges, and that together form an extraordinary prison memoir, yes, but also a chronicle of intellectual life during Fascism and the autobiography of one Europe's greatest political thinkers and philosophers of the last century - it seemed such an astonishing indignity for that particular book, such an offence to its history and ours, that it might even be suggested to remove it from view, let alone destroy it. It also underscored the poor intellectual effort that had gone into assessing the value of the library's collections, just when the times demanded our sharpest possible thinking on the subject of which print materials ought to be displayed, and how, and at what cost, and which titles would do better in a digital environment; how to balance the needs of current and future researchers with broader cultural considerations; how to understand the value of books as material objects, and the act of browsing them as a physical journey into a topic or the history of a country, within a set of spatial coordinates that don't always map well inside of a computer network. Antonio Gramsci didn't die in prison, but only just. Mussolini had him arrested in 1926 along with others Parlamentarians of the opposition. At his trial, in 1928, public prosecutor Michele Isgrò famously spoke of the need to 'render that brain of his inoperative for at least twenty years'. And while his steadily deteriorating health bought him some respite from the harshest conditions of his imprisonment, and finally an early release in April of 1937, he had regained his freedom for less than a week when an aneurysm killed him. He was forty-six years old. Far from rendering his brain inoperative, prison made a philosopher out of Gramsci. No longer able to carry out his active political duties as communist leader, he resolved from the outset to occupy as much time as he could with systematic studying and writing. Indeed in the very first letter following his arrest, addressed to the family whose apartment he was renting at the time, Gramsci asked if they could please send him some of his books and purchase for him a cheap copy of Dante's Divine Comedy. (He pointed out to them that these books would have to be stripped of their covers in order to pass inspection.) At his initial internment destination, on the island of Ustica, he started a school programme with Amedeo Bordiga and other political detainees. Later, in prison proper, he was involved in constant negotiations concerning which books he was allowed to receive and keep, how much stationery he was allowed to have, and how often he was allowed to write to his family and friends. These constantly changing restrictions on his reading and writing are painstakingly documented in the letters, which are also a chronicle of how the Prison Notebooks came to be. Here too the posthumous title is descriptive not of a literary or philosophical subject, but of a concrete practice, of the circumstances in which the author was forced to operate: in prison, on a series of thirty-two notebooks that he had no meaningful hope of seeing published. Yet to these notebooks he entrusted his thoughts on hegemony, on the philosophy of Croce, on the role of public intellectuals, on Machiavelli, on literature. It was his intellectual legacy. Nearly three thousand pages, each paragraph seemingly composed inside his head and then written down - like the letters - already in final draft, not to waste precious paper or the time that he was allowed to spend on such activities. And once his ill health finally forced him to abandon the project, in 1935, so too from his correspondence disappeared the requests for books or periodicals, all signs of the febrile discipline that had given him a focus and a purpose for the best part of a decade and of the gestures that accompanied it. Gramsci's life was winding down, and what little energy he had left was spent writing to his family in Russia, to his two boys Delio and Giuliano, whom he had barely had time to see and who were now just old enough to be able to read his letters and respond. Reading Gramsci's letters, more so than the Notebooks, I am reminded of Primo Levi and of his extraordinary compulsion to write while still a prisoner at Monowitz, knowing that if any of those scraps of hastily scribbled upon paper had been found on his person he would be put to death, and so they had to be immediately destroyed. Yet he wrote, as if the act alone could leave a material trace of his conscience, of his passage through that infernal machinery whose purpose it was to destroy him and every sign of his person. Gramsci too, albeit in a lesser hell, was almost physically consumed by the need to fight with the only weapon he had left the forces that wished to neutralize his intellect. 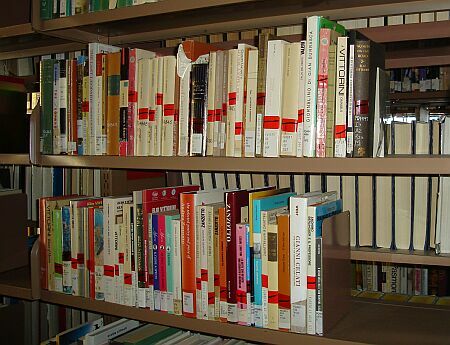 When a library wants to get rid of some of its books, it is sometimes referred to as a cull. Bear in mind that these are the same people who refer to the acquisition of digital information as ‘ingesting’. But culls need to occur, and it may not be as inapt a word as all that. In order to make room for new acquisitions a library simply has to either physically expand or withdraw some of its holdings. It happens all the time. Of course generally they don’t ask you about it. On your next visit you might simply find that a familiar book or series has disappeared. And since frequency of borrowing is in fact one of the indicators of the relative value of the titles in a collection, checking a favourite book out from time to time may just be a smart thing to do, if you really care about it. What made the exercise at Victoria objectionable then wasn’t the decision to get rid of some books, or the involvement of staff and students in the selection, but the ulterior aim, which was an actual reduction of the overall holdings so that other functions - primarily IT - could be expanded. By rights this move ought to have followed a discussion on what it means to have more computers and fewer books; whether or not it broadens access to key knowledge and resources; whether it leads to better research rather than just faster research. But in the clumsy way they went about it, the library administrators also created an interesting case study, in that they made visible and in fact indelible the process that leads to the elimination of books from a collection. 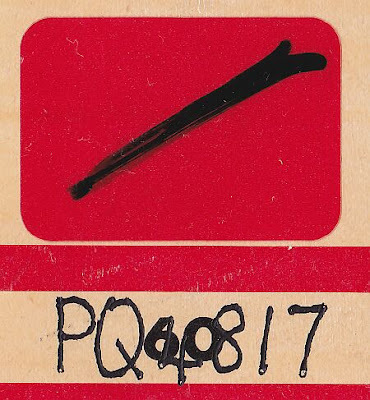 The red sticker on the letters of Gramsci, as well as the black mark on the sticker itself, are now part of the history of that book. They broaden its meaning and contribute to its interpretation, inviting further reflection on the material circumstances in which the letters were written, and the history of their publication and ongoing reception. And when the book is threatened to be displaced due the encroaching of a new technology, those signs also remind us that before the digital humanities there was this thing called the analogue humanities, and that the transition between the two is enormously sensitive and fraught. Antonio Gramsci. Lettere dal carcere. Edited by Sergio Caprioglio and Elsa Fubini. Turin: Einaudi, 1965. All the photographs were taken by me at the library in April of 2010. Readers who have come here by way of Hacking the Academy might be interested in Carl Dyke's response to this post at Dead Voles, as well as in the comments below.